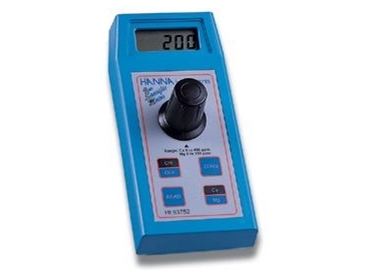 From Hanna , HI 93752 is a two-in-one microprocessor instrument that measures two important parameters in agriculture and hydroponics. HI 93752 has been designed to perfectly fit the needs of these applications in one portable photometer. HI 93752 measures calcium concentration from 0 to 400 mg/L and magnesium from 0 to 150 mg/L values in mg/L are displayed directly on the large LCD, eliminating the need for conversion tables. This handy and portable instrument with a low cost-per-test is an ideal alternative to chemical test kits. Accurate and cost-saving, this two in one portable photometer is factory calibrated to measure only calcium and magnesium giving you an instrument that is easy to operate in the lab or in the field. HI 93752 is supplied with 2 cuvets, battery and instructions.